Is Prof Lipstadt a "sneaker"? I'M wondering about this nonsense regarding what you said about Deborah Lipstadt "sneaking into London." Tell me: Is she required to alert you to when she comes to London? You don't let her know when you're coming to Atlanta, do you? And why would she have to alert you anyway? So she can present you with a bill for the money you still owe her, you deadbeat? 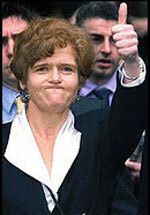 PROFESSOR LIPSTADT knows very well why she does not give advance notice of her public appearances in England. If you cannot work it out, then ask her the reason. She knows (hint: there's a cell in Holloway waiting for her; or perhaps it should be Pentonville -- one can never be too sure nowadays). If you don't believe it, invite her to give me formal notice when she next plans to visit. She won't. You suggest I "still owe her money". How ill-informed. I have never owed her money, on the contrary: in 2005 she started an action against my Trustees in the High Court (costing me around ten thousand pounds in legal and counsels' fees) demanding that all my assets be turned over to her; I had no choice but to enter an appearance to defend my possession. The court responded to her claim derisively, and she withdrew it. Under the U.K. Rules of the Supreme Court anybody -- anybody -- who fails in a court action they have brought, or who withdraws it, is liable for all the costs of both parties from the time they serve their writ (Claim). In her case -- surprise! -- the court found that "some exceptions apply". The court, historically and so far as I know uniquely, found that there were "special considerations" in her case which let her, alone, off the hook. Would it be anti-semitic to suggest that the relevant special consideration was a two-syllable word? How very wrong of me even to suggest it. As for the $13million costs incurred by the defence lawyers in my action DJC Irving vs. Penguin Books & Lipstadt, mostly spent greasing innumerable palms in and out of the courtroom, her entire costs were met, as she frequently boasted, by a Mr Spielberg and various other Hollywood notables. In legal language: She suffered no damnification (this side of Hell, anyway).